Big Country Paranormal will be investigating the Bellaire house on June 4, 2016. We plan to stream-live from Facebook appx 7:30pm. Like us on Facebook and standby for update-to-date information on this event. The following history was collected and written up by Christine L.
Belmont County was one of Ohio’s earliest counties, formed on September 7, 1801. It was originally a county in the Northwest Territory. Quakers were among the first settlers. The county is mostly rural. Historically, employment was found in coal, iron and steel industries. Belmont is part of the Wheeling, West Virginia Metropolitan Statistical Area. Mound Builders were numerous along the Ohio River and built complex earthworks. No prehistoric remains have been found within the city limits. The first Europeans to the area were French trappers and priests in the mid 1700s. After the Revolutionary War, George Washington supported giving land grants to the veterans. Post the Revolutionary War, Native Americans, the Delaware Tribe were involved in the Northwest Indian Wars. Bellaire was established in 1834 and was named Bell Air after one of the founders former home in Maryland. The town was renamed Bellaire by the railroad company in later years. During the American Civil War, Camp Jefferson was established in the village as a training camp and was used as a departure point for Union soldiers to the southeast. Coal mining was a major industry in the area and with it came disasters. Across the Ohio River, the Benwood Mine Disaster occurred on April 28, 1924. There were 119 killed by an explosion on a Monday morning. It was the 3rd largest mine disaster in West Virginia. Another disaster struck the Willow Grove Mine on March 17, 1940. Not nearly as many were killed. The house at 1699 Belmont, The Bellaire House, starts with the Heatherington family, who were big in the coal mining business. They were English immigrants. Jacob became friends with one of the founders, Mr. Davis, who named the town, and bought 8 acres, which was known as Heatherington Additions. Most of his children were born here. After losing dwellings to floods, he built a palatial home, the was called The House That Jack Built, named after his mining mule. Heatherington Additions were later deeded to his descendants. According to a book written by the current owner, which is confirmed with land records, deeds, wills and word of mouth, the Bellaire house has been in the Heatherington family in one capacity or another until about 1963. The house itself was built in 1900. The address was originally 1700 Belmont, but was changed to 1699 when property was split into smaller lots by the Heatherington family. Some of them sold off the other homes. The patriarch of the family, Jacob, deeded one of his coal mines to his granddaughter Lyde. This particular mine ran underneath the house. She ran the family business after her father passed away and lived in the Bellaire House. She did not marry. It is said, according to the book, that Lyde died in the dining room of the home. Her brother Edwin, who was a well known “seer” was so distraught, he moved into the house to be close to her. He hired mediums from all over the United States to connect her to him. He studied seers and the art of mediumship and it was believed he opened portals. He also died in the house. Since the last family member owned the Bellaire House in the 1963, it has had several owners and renters. The house eventually was sold to the current owner in a sheriff sale due to foreclosure in 2005. 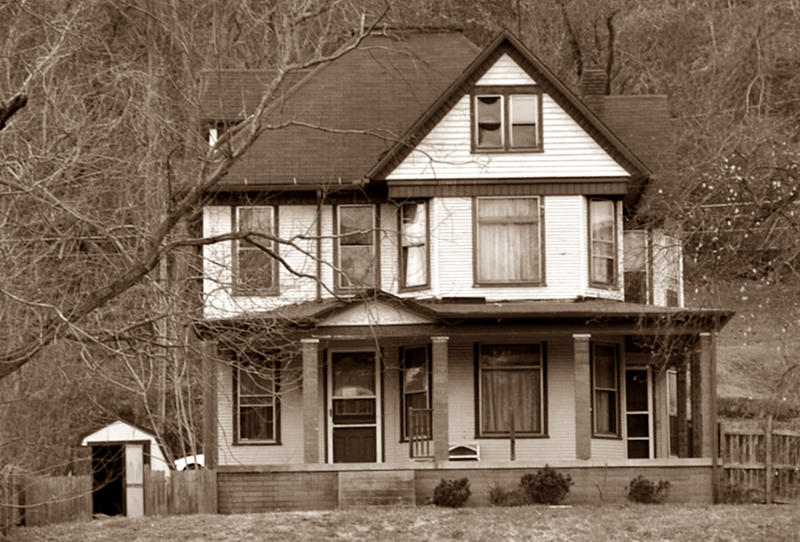 The owner tried to sell the house in 2010, but delisted it in 2011 and decided to open it for paranormal research. There is so much history of the family and area, I cannot do it justice. I have read the excerpt of the book, “1699 Belmont Street, A Portal to Hell”. It is a good read and informative, most of information gathered on the Heatherington’s came from it. 1699 Belmont Street was built in 1900. The lot size is 0.44 acres. It was last sold in 2005. It is a 2 story home with 8 rooms, attic and basement. It is located in Bellaire, Belmont Co., Ohio. Shortly after owner moved into the house, activity started. She stated she has heard footsteps and has seen a ghost of a grayish man wearing a cap. She noticed changes in behavior of her family and pet dog. She also stated that friends noticed a creepiness to the house. She says she has identified spirits of a boy, a girl, the grey man and inhuman entity. There are shadow people and objects will move on their own. She no longer lives in the house and hasn’t for a few years. She has tried to rent the home, but the renters do not stay long. Given the history of nearby coal mine disasters, Indian wars, Civil War, ley lines, the Ohio River, and deaths in the house, why wouldn’t this be a perfect haunted house?! 1 Comment on "BCP Team to Visit Bellaire House"